NASA Just Finished Testing Its Mega-Rocket Engines: What's Next? These engines will eventually blast astronauts toward Mars. Amidst a massive plume of smoke, on Wednesday afternoon NASA completed testing on the fourth and final engine that will launch its Mars-bound astronauts into space. But first, these engines will send the Orion spacecraft into the moon’s orbit, sometime in 2019. The RS-25 engine blasted out super-heated vapors for 500 seconds, which is the amount of time the engines will need to perform while lifting the 364-foot tall Space Launch System (SLS) rocket during launch. Beginning in March, all four engines were tested on a robust rocket stand at the Stennis Space Center in Mississippi. These specific engines were removed from the retired space shuttles and repurposed for the SLS rocket. Unlike the SpaceX Falcon 9 rockets, however, the SLS rocket is not reusable, so new engines will have to be built for its missions beyond 2019. The maiden 2019 launch mission, called Exploration Mission-1, will blast the Orion spacecraft toward to the moon. The mission won’t carry any astronauts, but will send Orion into lunar orbit and then return to Earth and splash down into the ocean. This success of this launch will determine the future schedule of crewed launches to the moon — and beyond. The timetable for a trip to Mars remains uncertain. For the past few years, NASA cited “the 2030s” as a feasible range for the deep-space endeavor. However, top NASA exploration managers are now less certain of this goal, and the reason why is a lack of funding. “I can’t put a date on humans on Mars, and the reason really is the other piece is, at the budget levels we described, this roughly two percent increase, we don’t have the surface systems available for Mars,” said NASA’s chief of human spaceflight, William Gerstenmaier, at an American Institute for Aeronautics and Astronautics meeting in July. A conceptual illustration of the Moon and Mars-bound Orion spacecraft. Although the SLS rocket and Orion spacecraft have received ample funding, which included the expensive testing of these four RS-25 mega-rocket engines, this has left no money for the other required Martian spacecraft. Specifically, NASA lacks the cash to build a vehicle that will rendezvous with the Orion spacecraft in Mars orbit. The Mars vehicle will both have to land on Mars and likely blast back off to reunite with Orion. 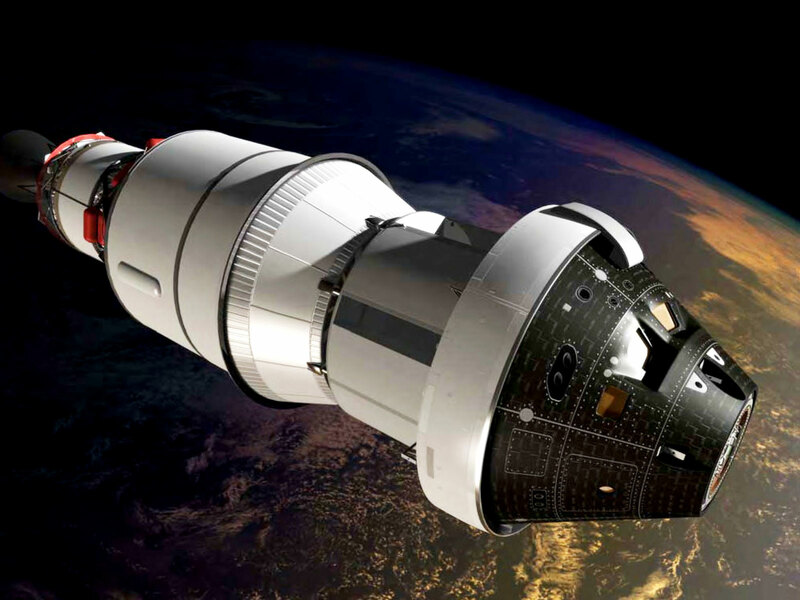 Then, astronauts can fire up Orion’s engines and begin their journey back home. For now, NASA appears on-track for its 2019 maiden test launch. If successful, the SLS’s eight million pounds of thrust will make it the most powerful rocket in the world.